The Northern Star Base Camp would use a 1907 hall at Fort Snelling to create an urban scout center unlike any other. The regional Boy Scout council’s plan to create an “urban base camp” at Fort Snelling promises to bring life to an empty century-old building that has cost taxpayers at least $3 million. The current owner of Fort Snelling’s old Drill Hall, the Minneapolis Park and Recreation Board, acquired it in 2000, but its plans for a skateboard park and other uses never materialized, and the cavalry building has sat vacant and unused. Now the Boy Scouts of America Northern Star Council hopes to close on the building in November and to open its $7.25 million complex in October 2010, the centennial of the chapter’s founding. The urban location of the “Northern Star Base Camp” is unprecedented nationally. The council aims to reach out to city kids who haven’t grown up going to the woods, said John Andrews, the council’s scout executive. What’s more, Scouts could take the Hiawatha light-rail line there. The 220-foot-long, red brick Drill Hall, also called the Hippodrome and the “201 Building,” is a familiar sight to those driving to the airport on Hwy. 55. It was built in 1907 to train horses to pull artillery and troops to practice cavalry dressage. Over the years, it went through other uses, including a materials testing facility for the U.S. Bureau of Mines. The Drill Hall was vacant when the Park Board bought it and surrounding land eight years ago. The main staff member behind the project, Park Board General Manager Don Siggelkow, was at a conference this week and unavailable for an interview, said Park Board spokeswoman Dawn Sommers. Siggelkow said in a 2006 interview that the Minnesota Wild had considered converting the building into a practice facility, but that proposal fell through. Then a company led by Robert Naegele III, the son of the Wild’s then-owner, signed a lease with the Park Board to turn the property into a privately funded skateboard park. Contractors put more than $1 million of work into the project before it fell apart in 2004. The contractors filed a lawsuit, Naegele’s company went out of business and the Park Board ended up paying $900,000 to settle related litigation in 2006. At the time, Park Board members said the public ended up having to pay for what was supposed to be a privately funded project because they mistakenly trusted the Naegele name. The board put the land and the building up for sale, and in 2007, voted to give the Boy Scouts of America an option to buy the property for $4.25 million. Arlene Fried, a longtime Park Board critic, describes the board’s experience with the property as a “monumental failure.” What was supposed to be a money-earner has instead cost somewhere close to $4 million when bond interest and legal fees are factored in, according to records obtained by Fried’s group, Minneapolis Park Watch. Sommers disputed that figure, saying the board’s attorney calculated it at about $3 million. Today, the windows of the building are boarded up, and the only regular visitors appear to be the pigeons that roost on its long red roof. Inside, unfinished metal walkways from the ill-fated skateboard park overlook the vast floor of dirt. The Boy Scouts’ vision for the Drill Hall includes a multipurpose space that will accommodate climbing walls, an indoor ropes course and room for all sorts of other activities. It will be open to all groups that want to use it, he said. “We’ll operate it as a public facility,” Andrews said. He said he doesn’t expect kids will camp on the site, but the trails and woods of Fort Snelling State Park are a short hike away. The council also plans to build a new building on the site that will house its offices and a scout shop, he said. This entry was posted in Miscellaneous on September 28, 2008 by Chris. Island Pavilion at the TC Daily Planet. Nicollet Island: Cash cow or public park? 2007 Audited Financial Statements have been recently posted. cover debt service at Ft Snelling Nieman. Board may put out an rfp for another beverage vending machine contract. detail at Park Board meetings. Pavilion overstates the public benefit of Pavilion improvements. Power Street, 2002 Inspections Permits. This entry was posted in Park privatization on September 25, 2008 by Chris. Skipperliner moved the boat from Bohemian Flats to Boom Island in the spring of 2007. They were having a difficult time getting customers to the [Bohemian Flats] site, so they combined operations at Boom Island. To say their site was taken away is a stretch at best. Seems to me, Mr. Sigglekow projected the revenues from Skipperliner would be 1 million dollars over the ten year term of their contract in 2004. Seems like he missed the mark a bit if they owe $20,000 in past due fees for last year and an estimated $35,000 for this year. Many business owners lost money due to the bridge collapse and I’m sure no one forgave their property taxes. Because the boat contract is based on a percentage of business, the fee paid for last season already was adjusted due to lower boat revenues attributed to the collapse. For Mr. Lawrence or Skipperliner to suggest they spent $150,000 because the Bohemian flats were not available to them is an outright lie. They are trying to get the tax payers to pay for a business loss which was the result of a tragedy where people lost their lives. At the same time they have been shamelessly promoting their tours as 35W bridge tours. This entry was posted in Miscellaneous on September 24, 2008 by Chris. Commissioners Walt Dziedzic, Bob Fine, Carol Kummer, Mary Merrill Anderson, Tracy Nordstrom, Jon Olson, Scott Vreeland, Annie Young and President Tom Nordyke. THIS MEETING WILL NOT BE broadcast live from 5-7 p.m. on the Minneapolis Comcast cable network Channel 14 OR online on the City of Minneapolis Government Meeting Channel. This entry was posted in Budget on September 21, 2008 by Chris. The lease for bridge work was signed at the staff level and may be invalid. I want to thank the Star Tribune for Mike Kaszuba’s provocative article “Bridge work at park has its price” (Sept. 13). It’s a story that needed to be told. However, there is one statement in the article that begs clarification. As a cofounder of Park Watch, I — along with others — have, through the Minnesota Government Data Practices Act, made it a point to access the Minneapolis Park and Recreation Board’s e-mails related to the negotiations over using Bohemian Flats as a staging area for Interstate 35W bridge construction and the Park Board’s subsequent lease with Flatiron Constructors Inc. We also have had representation at every Park Board meeting since January 2004. So when Park Board President Tom Nordyke was paraphrased as saying that “the board balked” at extending the use of Bohemian Flats to Flatiron, I immediately perceived that statement as misleading, because the full board never discussed Bohemian Flats and Flatiron. The lease with Flatiron for the use of Bohemian Flats was negotiated and signed at the staff level without board direction and without ever being brought to the board for the required approvals, which is a serious violation of Park Board procedure. The lease was for only four months; according to standard practice, it should have been worth approximately $51,000. But administrative staff tripled this figure, and e-mails reveal that Flatiron was coerced into paying $153,000 for a full year instead of $51,000 for only the four months that it needed Bohemian Flats. Flatiron representatives objected to the inflated figure, to no avail. It is apparent in reading the e-mails that the lease was signed under duress. It is also interesting to note that the lease bears the signature of Superintendent Jon Gurban, not that of Tom Nordyke, whose responsibility as Park Board president it is to represent the board when certain agreements are signed. Because of the circumvention of these board procedures, I question whether the lease is even a legal document. Arlene Fried, Minneapolis, is cofounder of Park Watch. Link to original Star Tribune publication. This entry was posted in Miscellaneous on September 21, 2008 by Chris. The following article by reporter Scott Russell appeared in the September 18th, 2008, on-line TC Daily Planet. The Nicollet Island Pavilion appears to be a cash cow for the Minneapolis Park and Recreation Board and for a private catering company, but is it the park and open space promised to the public when it was bought with public funds in the 1980s? The Park Board bought most of Nicollet Islandâ€”including the building that is now the Pavilionâ€”with money from the Metropolitan Council. That money came with strings: The Park Board needed to devote the land exclusively to “regional recreational open space for public use.” If the Park Board wanted to lease out land, say to a catering company, it needed prior Met Council approval. Today, Mintáhoe Hospitality Group has exclusive catering rights at the Nicollet Island Pavilion, under a deal first cut in 2002. However, its lease with the Minneapolis Park and Recreation Board contract could run afoul of the decades-old restrictive land use covenant that is only now being reviewed. Critics of the deal have pushed public officials to investigate. Among the complaints, they have noted that Mintáhoe moved its corporate headquarters into the Pavilion, making it a private space. They got the Metropolitan Council’s attention and it is reviewing agreements old and new. Don Siggelkow, the Park Board’s General Manager of Administration is quick to list the Pavilion’s positives: Private investment has upgraded the once-industrial building and improved services. It is the most lucrative Park Board contract, raising $400,000 a year. An April 29, 1988 Barbara Flanagan column predicted a wonderful reuse, saying the building could become “the most popular eating spot in downtown Minneapolis.” Park Board Secretary Harvey Feldman told her at the time that it would be open to the public about 70 percent of the time. During the other 30 percent, it would be rented for private parties, including wedding receptions. Siggelkow said the Park Board hasn’t changed the Pavilion’s use since it opened. It was always an event center, even when the Park Board ran it. The outside patio area overlooking the river still is open to the public, he said. The contract reserves the Pavilion for eight Park Board events, including New Year’s Eve, New Year’s Day and July 4. The Park Board and Mintáhoe amended their contract in 2004. The changes included extending the term from 10 years to 22 years. The letter was addressed to Siggelkow, who said on September 9 that Park Board attorneys were still working on a response. One Nicollet Island resident, Edna Brazaitis, disagrees with that statement, saying that the Park Board effectively gave Mintáhoe control of the building and surrounding spaces. She is one of several critics of the deal who have done detailed research and pushed other units of government to investigate. In an August 28, 2007 letter to the Department of Finance, Brazaitis said the Bicentennial Amphitheater next to the Pavilion used to have concerts and performances such as Shakespeare in the Park. They stopped after Mintáhoe took control, she said. Shane Stenzel, Park Board manager of special services, explained why. He said there are still free concerts at the amphitheater three to four times a year, but groups cannot lease it. Other public events at the amphitheater clashed with some of the Pavilion’s events, he said. Parking is limited. Further, people in neighboring highrises complained about concert noise, he said. Pavilion events, such as outdoor weddings, still use the amphitheater space, Stenzel said. He said groups looking for a nearby performance space could use the nearby Father Hennepin Bandstand next to the Stone Arch Bridge instead. Braizitis’s letter also takes exception with Mintáhoe’s expanded use of Park Board space, a claim the Park Board doesn’t dispute. Braizitis said Mintáhoe requested a building permit at the Pavilion to add office space in 2006. She has photos of signage stating that the Pavilion is Mintáhoe ’s corporate headquarters. That meant the business was running not only the Pavilion operation out of the Pavilion location, but its family of businesses as well, she said. Since Mintáhoe pays the Park Board based on a percentage of catering sales, not a flat lease, the Park Board was not getting paid anything for the corporate headquarters, Braiztis said. Sigglekow said Mintáhoe needs operations and sales staff on site at the Pavilionâ€”but using the Pavilion as a corporate headquarters was not part of the agreement. The Park Board gave Mintáhoe notice that it needed to move its headquarters off site, Siggelow said. The notice was given three months ago, when the Park Board discovered that Mintáhoe had moved more people to the Pavilion than it knew. 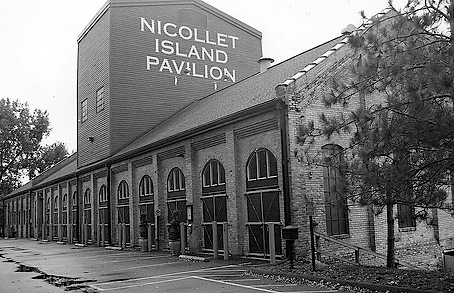 As of September 18, Mintáhoe’s website still listed the Nicollet Island Pavilion as the corporate office. Mintahoe did not return phone calls for comment regarding issues raised in this article. Scott Russell is a journalist. He wrote for the Southwest Journal and Skyway News (now the Downtown Journal) in Minneapolis from 1999-2005. He also wrote for The Capital Times, a Madison Wisconsin daily, from 1993-1999. This entry was posted in Park privatization on September 19, 2008 by Chris. Click here to see the mega-ton crane called Bohemian Blue which was temporarily located on the northern portion of Bohemian Flats off of West River Road Parkway and just south of the 10th Avenue Bridge. It was this piece of critical equipment that the Park Board’s administrative staff threatened to evict for “trespassing” on Bohemian Flats during the reconstruction of the I-35 Bridge by Flatiron-Manson. See previous post of Star Tribune article by Mike Kaszuba for the full story. This entry was posted in Miscellaneous on September 17, 2008 by Chris. The following are selected on-line comments made by readers in response to the Star Tribune’s Sept 12, 2008 on-line article by Mike Kaszuba. The 2007 Charter boat season was basically over by the time that cleanup of the fallen bridge was completed and FM started work on the new bridge. There are state laws both on “gouging” and on governmental agencies charging “unreasonable fees”. The “gouging charges” can have triplicate damages plus the aggrieved’s legal costs. There is also the matter of a potential attempt to obstruct interstate commerce since this was a Federal Highway System freeway bridge. A case like this would likely be heard in Federal Court. Federal jury pools tend to not be “downtown”. When it became known that various for-profit tenants operating from Minneapolis Park Board land had never paid their proper taxes, Park Board officials seemed only interested in minimizing the tax amount due. Those same taxes pay to support the Park System, and it wasn’t as if the taxes would come out of the Park Board’s pocket. So why the favoritism? These entities are also for-profit, as is Flatiron, and lots of businesses lost money because of the bridge collapse. I find this price gouging and coercion unconscionable. If you want to go after some money, go after the caterer on Park Board land who has STILL not paid their taxes despite making a bundle on the RNC events. This story has a lot of strange and misleading things going on. I have the utmost respect for Scott Vreeland (whom I know personally) and Tom Nordyke. Yet statements attributed to Tom simply can’t be true. Either the reporter erred, or Tom lied. The reporter paraphrases Tom as saying “the Board balked…at simply extending its use to Flatiron”. But the Board cannot have balked as the issue was never brought before the board. Park Board meetings are open to the public and recorded and broadcast over cable TV. Citizens who follow the Park Board meetings report the issue never came up. Additionally, later in the same article, Tom says he himself “was unaware of police being sent to the property.” The same sentence contains the outrageous whopper of lie where a “Park Board spokesperson said police had gone there to photograph Flatiron’s equipment.” Does anyone believe Park Board sends police, not staff, to photograph things? Moreover, Flatiron workers at the site report that the Park Board police threatened them, essentially being told to remove their equipment immediately or face arrest. Peter Sanderson’s remark was the most accurate thing in the story: “it was a business proposition, just like the Mafia does.” This is not the first time the Park Board has extorted money from contractors, Mafia-style. This kind of thing has been going on for years. But with an actual police department and barracuda, inside-connected attorney Brian Rice on the side of the Park Board, none of those contractors has been interested in risking their necks to tell their stories publicly. The Park Board’s elected commissioners, like Tom Nordyke and Scott Vreeland, are kept in the dark by the executive management (Jon Gurban, Don Siggelkow), particularly about their backroom and underhanded dealings with contractors, both favored and abused. And lastly, where did the money from this “rental fee” that Flatirons paid go? This entry was posted in Miscellaneous on September 16, 2008 by Chris. Hope you saw Mike Kaszuba’s story, Bridge work at park has its price http://www.startribune.com/local/28335809.html. The Minneapolis Park Board charged Flat Iron $153,000 to use Bohemian Flats as a staging area during the 35W bridge reconstruction. Flatiron was not happy. This summer, ParkWatch uncovered a copy of an email recapping an April, 2008 meeting between Park Board and Skipperliner staff that suggests the $153,000 Flatiron payment will not be used to help our park system. Rather, the money will be diverted to aid Skipperliner, the private boat operator at the central Mississippi riverfront. The Skipperliner use agreement with the MPRB runs through 2014 with possible extensions through 2024. The Park Board receives about $35,000 a year in fees from Skipperliner. I don’t believe that the Skipperliner improvements or fee waivers have been brought before the MPRB Commissioners. Perhaps the MPRB Commissioners on this list will provide more information. Related News: I’ve heard that the St. Anthony West neighborhood group is opposing construction of a new parking lot at the junction of Boom Island and B F Nelson Parks (the STAWNO minutes are not online) and NIEBNA will consider the issue at a future meeting. The new lot would free up more parking for the riverboat operator. Editor’s note: scanned copy of entire original email message attached below. In 2005, Park Board staff proposed adding mini-golf to Lupient Water Park. The initial budget was $100,000 in construction cost and $80,000 in revenues a year – so a project that would be a money maker in two years! It hasn’t worked out that way. Project costs are up to at least $350,000 and revenue projections have been substantially lowered. The project was delayed and did not open summer 2008. A history from documents is below. 2012 Net Income Estimate $ 85,000"
The MPRB Board approved the architect’s contract at the Sept 4 2007 meeting. The landscaping work commenced in November 2007 per an MPRB press release dated Nov 13 2007. On August 6, 2008, the MPRB Commissioners approved a Phase I construction contract of $197,487. Total construction cost was estimated at $340,000 per the staff report. This does not appear to include Design/Project Management and, it is not clear if this includes the 2007 landscaping work. This entry was posted in Miscellaneous on September 14, 2008 by Chris.